We can deliver best live sheep,boer goats, and cattle from europe with all certificates. e supply live sheep , & Live Goats , & cattle ( steers and cows), calf ( young ) for the best price you can find ! Given the fast growing rates of demands world wide, We offer the best of these live stock sheep ,lamb,goat , Donkey & cattle to all our customers at affordable prices to sign long term deals. 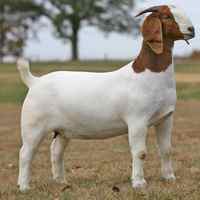 Price per Boer Goat : Negotiable . Packaging Detail: export standarfication .